In a CAD centric setup of PDMLink we have chosen to have the attributes "Filename", "Name" and "Number" in sync. 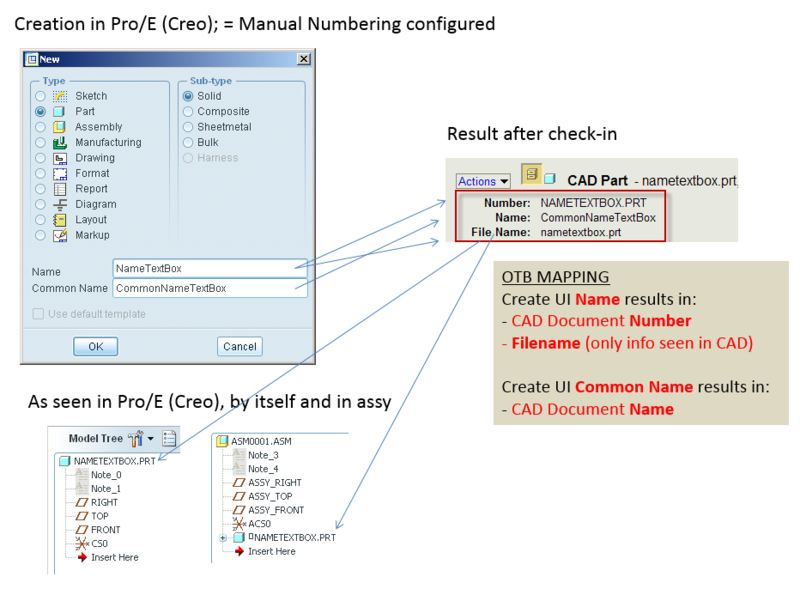 CAD users coming from Creo and Pro/Intralink environment are not used to the differences of "Filename", "Number" and "Name". They usually only care about the "Filename" as this is what they need for working with Creo Parametric (Window Management and Model Tree). As soon as the three attributes get out of sync due to a Save As or Rename action the users get totally confused. 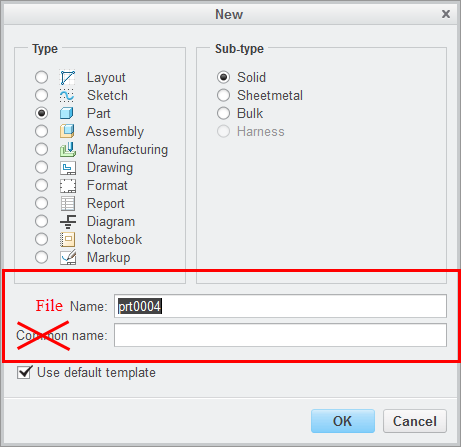 Some tables in PDMLink cannot be configured to display "Filename" - they can only show "Name" or their Table Displays are not configurable at all. This is the point where wrong datasets are selected for actions. A general property to sync these three attributes, show one of them and hide the other two from the UI is needed. E.g. "Filename" is master and "Number" and "Name" are hidden. The UI for Rename and Save As should incorporate these settings and only show the "master" attribute. Currently we have to use heavy customization to ensure the synchronization during upload, check in, Save As and Rename. I'm continually baffled by why people want Name to match Number. People go to great lenghts to make them match. The CAD Document Number can be auto or manual, but generally is something like 000002341 or 2389872479. The CAD Document Name should be helpful, descriptive text, like Bracket or Screw or Module. PTC, please standardize the labels of these items across all of your products. Name should be Name in Creo too,not Common Name. Why do CAD documents need an additional Number? Make the Creo filename it's Number and call it that. I think the urge to make all of the fields the same, Filename, Name & Number, comes from organizations that have not made the jump from CAD as master to WT Part as master, as noted in the first sentence of this idea. Once an organization starts trying to implement downstream processes, ERP, etc. they quickly realize that a CAD-centric approach is not sustainable. However, I agree that there needs to be much greater control over the way these attributes behave. I don't think it is a CAD or Part centric setup, but as you say , more an standardization of labels. I would suppose it is customer dependend. Some customers do have the use case that name not equals number and even not equals filename. Windchill PDMLink provides various ootb and customizations to keep the triple sync if you want to. Object creation, saveAs and rename should be configured or customized in a more or let´s say less easy way. I would prefer to have it configurable. In my case I understand the meaning of "Name" but always want to have "Number" matched to "Filename". Relating to the missing "Filename" column in some dialogs. We're using Windchill 10.1 and I think it became much more better than before, but having It as standard for all Dialogs would be perfect. (mentioning the Idea of the configurable master-column). The previous admin here created this graphic below. I agree with the comments above about the Name in Creo and the Common Name in Creo. They become misleading and confusing. It would be good if the dialog said: Filename, and Descriptive Name. Or perhaps was Windchill aware, and it could have spaces for all three attributes. I would support a synchronization option. At the same time, what do you do when there is more than one cad model of the same part? For instance bent and flat sheet metal parts? Or straight and routed hose models? They would have the same number and perhaps attached with the associate Content? I haven't had the luxury of testing this directly though. Having Creo be Windchill aware would be a huge step forward. I don't understand why this hasn't happened yet. PTC, what's the hold up? I still don't get why PTC hangs on this "ugly" dialog. If Creo is connected to Windchill they could just show the Windchill create CAD Document wizard. So at least the user knows what to enter and also the different attributes with the enumerations and attribute length etc. works. Why PTC calls the attribute in Creo "Common Name" and and in Windchill "Name" makes it for the user also not easier. Steve Shaw‌, while that may be helpful for some, it would be much better to simply align the terminology in Creo with that used in Windchill. This picture is from Improve consistancy between Creo and Windchill. No disagreement here. It is something that is on our backlog as well. However, the Create CAD document does have the benefit of allowing users directly in Creo to set additional Windchill attributes and security labels (if configured) during the create process. I agree that having both dialogs seems redundant. ** While the new dialog may be helpful for certain companies, I don't see us ever using it. We never create new cad files directly from Windchill, we only do this from Creo. There is also no correlation between the Creo template paths and where Windchill stores its templates. (I could be wrong, but I don't think Creo can even see the Windchill administrative location for templates...) For those companies who are more Windchill centric or using Windchill to create structure, this new dialog might make sense, but for those who are CAD centric and simply use Windchill to store and manage their CAD data, this new dialog probably isn't going to be very useful. I don't really care if the new one is added, but I still think the old one should be changed to keep the terminology consistent. As an aside, from the picture above this looks like a web browser dialog which probably also means that it won't work with mapkeys. Edit: ** Yes, create the new dialog if you want, but please give us a config option to hide it and also fix the old dialog to match terminology. Sorry Steve, but this solution is just ridiculous. You can not say that PTC is a PLM (or whatever) company and still thinks that both world native and PDM works together. Bring a solution for PDM and make it switchable to nativ for standalone Creo. But as we already talked in this community, the focus from PTC is probably wether Creo nor Windchill at the moment... And that's the result. 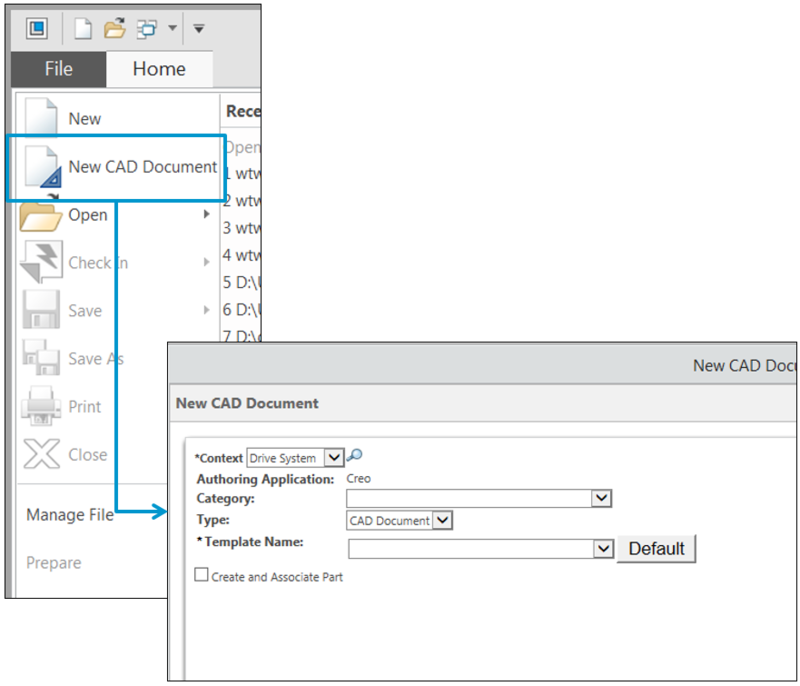 I have just found this out that the templates available for File > New and New CAD Document are NOT the same and can't be kept in sync except manually. I am also struggling a little with trying to put our formats in the drawing templates and have it usable in the New CAD Document area. Since I have to have the format exist in our library template area but the site based template appears to be a separate database I would need to have them defined there and I'm afraid I would end up with people having issues trying to check in the format from outside the regular database. This is Japan PTC/USER office. Today, we had a Widchill TC regional meeting in Tokyo. All of the Japan Windchill TC members also agreed this enhancement.